When June hits Europe, there are places that you should be avoiding as they will be flooded with holidaymakers. Still you want to spend somewhere your summer holidays. Where should you go on holidays in Europe in summer and which destinations should you avoid? You will find the answers here. In the summer for three months (June, July and August) Europe faces the big holiday exodus. People are going en masse on holidays and this does not only apply tor families with kids who have no other choice as the children have fixed summer break and it’s difficult to travel outside of them. On the other hand the summer holidays are becoming a tradition – a sacred ritual that repeats every year and offers the much deserved annual break from your 9 to 5 job – an escape from your everyday life. Of course you may chose to travel outside of the summer months, searching for the sun in not so traditional destinations, but what if you still want to go on vacation in July or August. I’ve personally tried travelling in October – November, but it feels different. Nothing compares to a traditional summer holiday. The tips below are for independent vacationers, for people who don’t book their holidays via package deals to all inclusive resorts. 1 How to choose a less crowded summer destination in Europe? DISCLOSURE: This post contains affiliate links. If you book your hotel using the links below immediately after you have visited my page, I will earn a small commission at no extra cost for you. How to choose a less crowded summer destination in Europe? Let’s face it, with our overcrowded planet and the increasing opportunities to travel, there are less and less places where there’s a chance for you to be the only tourist. In some parts of Europe it gets so bad that for example in France there is the phenomenon ‘Black Saturday’ (no, I’m not talking about discounts, unfortunately). This is the day with the longest traffic jams on the highways when you can spend even half a day in your car without moving an inch. Or you have to go to places where tourism is underdeveloped with less facilities. So, at some point you will need to make a compromise. Large cities like Paris, Rome and Amsterdam will be overcrowded. Don’t even bother visiting them. My advice – better leave them for a short city break in spring or in autumn. Read more: Which are the best cities to visit in Europe in autumn? Some places tend to be very touristy and the locals avoid them. At some areas this is really extreme. For example, resorts like Sunny Beach or Golden Sands in Bulgaria are a no-go for the locals and yet they are pretty popular among foreign holidaymakers. A good sign for a less touristy place is when there are no all-inclusive resorts. These will be destinations offering package deals and it means they will be overcrowded. Buses will be pouring tourists each day there and the chances to see anything else beside your resort or hotel are quite small. In this case travel blogs are your biggest friend. When you are researching a destination, go beyond the tourism sites or commercial websites and check travel blogs, where you can find personal experiences and recommendations. If you are reading this, you are on the right track and already doing your due diligence for the summer holidays. Use this interactive map to find your next summer vacation destination. Click on a place to jump directly to it. So, here are my suggestions for a relaxed and quiet summer holiday destination in Europe. Are there still places in France, which aren’t that touristy, where you can spend your holidays? Yes, there are. Just avoid Paris and the Mediterranean and you’ll be good. This laid-back area in France follows the lazy waters of the Dordogne River. Charming little villages, medieval castles and beautiful nature – the essence of France at one place. I’ve spent 10 days exploring this lovely region, staying in Argentat and making day trips to the near-by places. Visit Domme for those amazing views over the Dordogne Valley, or the medieval town clung to the rocks – Rocammadour. The quaint little villages Loubressac and Beaulieu-sur-Dordogne are also a must-see. If you are chasing castles – visit the ruins of Les Tours de Merle, if you love beautiful gardens – the incredible Les Jardins d’Eau won’t disappoint you. How to get to Dordogne? You can fly to Brive–Souillac Airport or to Limoges – Bellegarde Airport – some European low-cost companies have seasonal flights. Of course, you can always fly to Paris and drive to the south. The best way to explore the area is by car. Where to stay in Dordogne? How to prepare for your trip to Dordogne? The most charming villages of France – along the Dordogne River. I have to admit that this is one of my favourite places to spend my summer holidays is France. If I say Southern France, what pops up in your mind? Of course – lavender fields, sunflowers and little villages full of southern charm! One of the most beautiful areas in France is undoubtedly Provence. To escape the crowds in this much visited area in France, stay near the Lake of Sainte-Croix. 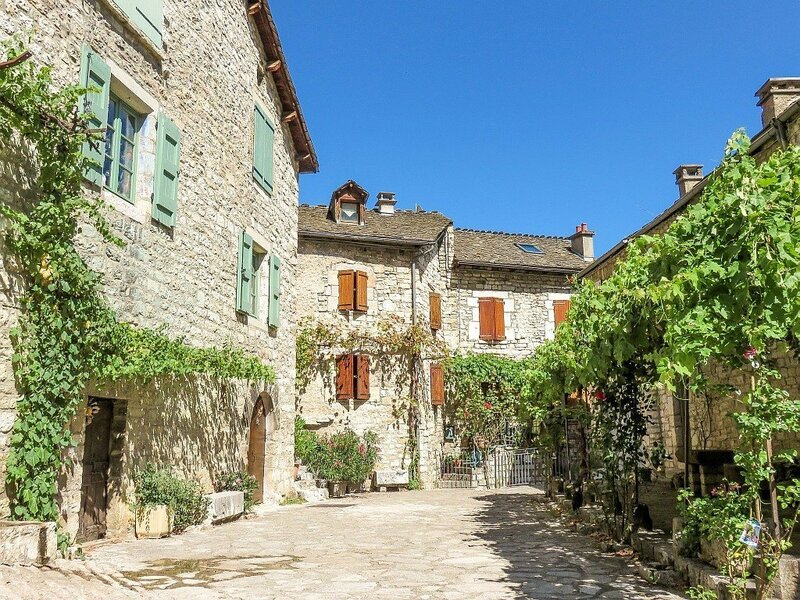 From there you can visit the breathtaking Gorges du Verdon – the biggest canyon in Europe, or the charming Moustiers-Sainte-Marie, Bauduen and Castellane. For the most gorgeous views on the lake, visit Aiguines and for the most purple experience – the lavender fields near Valensole. I’ve spent 10 days near the Lake of Sainte-Croix where I enjoyed the region travelling slowly and sipping on its beauty. OK. And on red wine. How to get to Provence? You can fly either to Marseille Provence Airport or to Nice Côte d’Azur Airport. Most of the low cost airlines and some of the biggest airlines in Europe have flights to this part of France. To discover Provence, you will need to rent a car. How to prepare for your trip to Provence? Gorges du Tarn is the ultimate place for a summer detox amidst beautiful nature. Located between Lozère and Aveyron, the canyon along the Tarn River is perhaps one of the most picturesque places I have seen in Europe. I’ve spent 3 weeks in the area and I couldn’t get enough of its charm and tranquility combined with dramatic landscapes and ultimate doze of quiantness. Visit the caves Aven Armand and Grotte de Dargillan and take a road trip along the canyon formed by the Tarn River. Take a detour to the adjacent Gorges du la Jonte – another canyon cut out by the Tarn tributary – La Jonte. Stop by at the small villages of La Malène, Sainte-Enimie, Le Rozier, Peyreleau, Ispagnac, Florac and the list just goes on. How to get to Gorges du Tarn? You can fly to Montpellier–Méditerranée Airport or to Marseille Provence Airport. If you want to discover this area in France you will definitely need a car. You can’t make this trip relying on public transport. Where to stay in Gorges du Tarn? How to prepare for your trip to Gorges du Tarn? How to pack for summer in Europe? Italy has the name of a popular travel destination, but you can still escape the summer crowds if you visit places where the locals go. Tuscany is simply adorable and if you love places with rich historical and cultural heritage – this region in Italy won’t disappoint you. Travel among gentle rolling hills and vineyards, admire the medieval towers of San Gimignano, or learn about the lost civilization of the Etruscans in Volterra. Of course, you can’t miss a visit to Florence, Sienna, Pisa or Lucca. I’ve spent 10 days enjoying the sun and the Italian way of dolce far niente. Tuscany can be sometimes crowded, especially Florence, but if you travel slowly, you will fall in love with it. How to get to Tuscany? Fly to Pisa International Airport or to one of the two airports in Rome: Fiumicino International Airport “Leonardo da Vinci” or Ciampino International Airport “G. B. Pastine”. You can travel around in Tuscany by public transportation, but in order to be flexible, you will need a car. I’ve stayed in a lovely bed and breakfast just outside of the city walls of San Gimignano. My advice will be to get a place with a swimming pool, as summers are hot in Tuscany and there’s nothing more refreshing than jumping into the cool waters after a day of sightseeing. For more accommodation ideas, use the map below. How to prepare for your trip to Tuscany? If you are into unspoiled azure waters and golden sands, then Sicily is the place for you. Of course, you’ ll find there lovely towns, tons of history, some great temples and a volcano. The best way to discover Sicily is to make a road trip. I’ve visited the Italian island two times in the summer and I loved it! However, I have to admit that it’s a bit on the hot side, so be prepared. When in Sicily, don’t miss the Valley of the Temples near Agrigento and the historical towns of Syracuse, Noto and Taormina, or the adorable Scopello, Castiglione di Sicilia and Caltagirone. You can fly either to Falcone Borsellino Airport in Palermo or to Catania–Fontanarossa Airport. As I am recommending a road trip, renting a car is essential for it. How to prepare for your trip to Sicily? What to pack for your summer trip in Europe? The Netherlands are not your typical summer destination in Europe, but still they can offer pristine beaches, amazing nature and tons of lovely places. Avoid in summer Amsterdam and the big holiday resorts. Besides, one third of the Dutch spend their summer holidays abroad, so why not visit their country when they are gone? Limburg is the different Netherlands. Why? Because there are hills there. You can travel the Netherlands far and wide and see nothing but a countryside flat as a pancake, but as soon as you head to the south, the landscape changes drastically. OK. Drastically for to the Dutch standards: rolling hills, cute small villages and even caves! My advice is to choose South or Middle Limburg as your base and discover the area in day trips. Do not miss the lovely Thorn with some great stories behind, Valkenburg with its castle and caves, Gulpen with its beer breweries, or Vaals with the highest hilltop in the Netherlands and the tripoint. When you have enough of the cuteness of those little places visit some of the big cities – Maastricht, Sittard and Roermond. If you love classical music, the world famous conductor André Rieu is giving concerts each summer on Vrijthof square in Maastricht. I have to admit – this is a one-in-a-lifetime experience! Oh, and if you are a nature lover, there are some great parks in Limburg – the Meinweg National Park or the Brunssummerheide. Castles? Oh, there are plenty of them in Limburg: Schaloen Castle, Valkenburg Castle, Hoensbroek Castle, Genhoes Castle, just to name a few. How to get to Limburg? You can fly to Maastricht Aachen Airport (some low-cost companies have seasonal flights to this airport) or to Eindhoven Airport, where most of the low-cost airlines fly to). Amsterdam Airport Schiphol is also not far away. Where to stay in Limburg? How to prepare for your trip to Limburg? This lovely Dutch island is a National Park by itself, which makes it the perfect place to escape the world. If you search for ultimate tranquility and city-life detox – Texel is your place! Large white-sand beaches, sand dunes, pastoral views, wild animals, amazing sunsets… And do not forget – Texel is all about slow travel and enjoying each single minute of the day. When on Texel, visit the little cute Den Hoorn, or why not even stay there (see my recs below), the lovely Den Burg with lots of sunny beer-terraces, De Cocksdorp with the famous lighthouse. You can even do some island hoping in the summer and visit the rest of the Dutch Frysian islands – Vlieland, Terschelling, Ameland, and Schiermonnigoog. How to get to Texel? You have to fly to Amsterdam Airport Schiphol and then you need to take the ferry from Den Helder. This summer holiday is doable only by public transport, even it’s advisable not to go by car on Texel. Once on the island, you can explore it by foot or by bike. Where to stay on Texel? How to prepare for your trip to Texel? How to get to Zeeland? You can fly to Rotterdam The Hague Airport (some low-cost companies have seasonal flights to this airport) or to Eindhoven Airport, where most of the low-cost airlines fly to, or ultimately to Amsterdam Airport Schiphol. For this trip you will need to rent a car. Where to stay in Zeeland? How to prepare for your trip to Zeeland? Never thought of spending your summer holidays in South Bohemia, have you? South Bohemia offers the perfect combination of beautiful nature, quiet countryside with pastoral views, cute little villages, and some great hisotrical sites. If you stay at Lipno Lake, the Shumava National Park is just across the shore. Discover what is Folk Baroque in Holašovice – a UNESCO World Heritage Site, visit postcard perfect Český Krumlov and its castle (another UNESCO World Heritage Site), take a day trip to the lovely České Budějovice, the historical Tábor, or the picturesque Písek. If you love good food and good drinks – South Bohemia won’t disappoint you with the choice of craft beer and yammie regional dishes. How to get to South Bohemia? You can fly to Václav Havel Airport Prague and you will need to rent a car, otherwise you won’t be able to travel around in the countryside. Where to stay in South Bohemia? How to prepare for your trip to South Bohemia? In general, Bulgaria is a less toruisty destination. And I hope it will stay like this for long time to come. This place has a wow-effect on each traveller. Rounded hilltops, ancient woods, green pastures, dashing brooks and winding roads – I guess you already get the picture. If you enjoy hiking, you will fall in love with the Rhodope Mountains. The mountain villages will bring you back in time, offering a romatic vibe of times gone for good long ago in the rest of Europe. Visit the cute little Shirola Luka, Gela and Momchilovtsi or the restored ethnographic village in Zlatograd. In search of some jaw-dropping nature? Get to the Eagle Eye and make a road trip along the Trigrad Gorge and Buynovo Canyon, visitng the Yagodina Cave and the Devil’s Thorat. Get on top of the Snezhanka TV tower near Smolyan for mesmerizing views or hike along the Smolyan lakes. How to get to Rhodope Mountains? Your only option in Bulgaria is to fly to Sofia Airport and then rent a car. There are some seasonal flights also to Plovdiv Airport, but I won’t rely on it. Alternatively, you can use the Thessaloniki Airport in Greece. Where to stay in Rhodope Mountains? How to prepare for your trip to the Rhodope Mountains? I was born and raised in this part of Bulgaria, so I’ve spent a greater part of my life in one the most beautiful cities in the world, according to my own classification – Veliko Tarnovo. This part of Bulgaria is not a popular summer holday destination and when the students leave the city for the summer break (Veliko Tarnovo has a univesity), the city gets desolete. Visit the lovely Arbanassi with its beautiful views on Veliko Tarnovo, the cute Tryavna with architecture in National Revival style, or the ethnographic complex Etara with its handrafts. There are many hiking trails in the area or mountain rivers with lovely pick-nick spots and waters deep enough to get a plunge. Get to the Emen Canyon and visit the Hotnitsa Waterfalls or the Krushuna Waterfalls. Love caves? The Bacho Kiro Cave near Draynovo is a must. When there, stop by at the Dryanovo Monastery. How to get to North Bulgaria? You can fly either to Sofia Airport or to Bucharest Airport. It’s possible to travel by public transport, but the best is to rent a car. Where to stay in North Bulgaria? I would recommend staying in or around Veliko Tarnovo. I have a comprehensive guide of all hotels in Veliko Tarnovo, so check it out. How to prepare for your trip to North Bulgaria? Where to spend your summer holidays in Europe? Pin this 11 ideas! AWESOME inspiration for this summer – there are so many places I haven’t been to yet! 🙂 Very excited about exploring Bulgaria. Great article, thank you! Thank you for the kind words! I am sure you will fall in love with Bulgaria! Thanks for the tips. Sometimes it’s nice to avoid the crowds. I honestly haven’t heard of a lot of these spots so I’m sure the tourists will be at a minimal. That’s the idea – spreading the tourism to other places to avoid the overtourism at the most popular ones. Some gorgeous locations – I’d love to go to Bulgaria this year!